My deal of the week OR How I bought a great purse so cheap it felt like I stole it OR God bless Macy’s. You pick. I went to Macy’s last Thursday to find some shoes. Comfortable walking shoes, that’s what I was looking for. Something to wear on vacation when you’re planning to walk for hours on end. Something I could slip on and off easily so I wouldn’t get cursed at in the security line at the airport. You know what I mean. You’ve been there. If you didn’t curse out loud, you totally did it in your head. Hopefully. So anyway, I walked into Macy’s with my mind set on walking shoes that didn’t look like something a nurse would wear for long shift work and I got lucky. I found a pair I liked that fit. Sounds easy, but really it’s not for me. You see, I wear a size 10 double narrow. Yeah, wrap your head around that for a second. Not one to just buy one thing and walk out when I’m all alone with time to kill, I handed my super cute, uber comfortable vacation shoes to the cashier and had her hold them while I perused the purse department. Now I may or may not have mentioned that I have a handbag addiction, which is funny because I usually carry a small purse at all times. The same small, cross-body bag… all the time. It’s a Baggallini. I have their Everyday Bag in tan with a light blue lining, and it’s awesome. But as I was saying, I still find myself drawn to purses. Is it a genetic thing? I wonder. Are girls programmed to love purses? Am I betraying my gender by even asking that question? If it’s not genetic, then it is most likely a virus I picked up – probably from touching a shopping cart at the grocery store. PS – thank you, Store Managers, for putting sanitizing wipes next to the grocery carts. I love you for that. I really do. It's actually a nice olive green. I promise. The back side. Ha! I said backside. The color is a little more true-to-life in this photo, but it’s still a little washed out. I probably should have taken it outside to photograph it, but that would just make my neighbors wonder why I was standing on my lawn snapping pics of a purse. Most of them don’t know I blog, and I like that. Makes me feel stealthy. Mysterious. Anonymous. I could say anything about them, and they wouldn’t know it was me. But I wouldn’t, because I have a hard and fast rule that I never put anyone’s photo or real name in my blog without their permission. Sometimes, it’s just hard being good. Right now, you’re probably thinking, “Wow. She really needs to put down the Dr Pepper” and I would but I already finished it and threw the can in the recycling bin. It was tasty. I had it with a gyro combination plate at my local Mediterranean grocer today at lunch. Drank it straight out of the can with a straw, because I’m that girl who thanks store managers for putting sanitizing wipes next to shopping carts. I also sourced some garbanzos, haloumi cheese, pita bread and some Syrian yogurt, but I’ll save that for another post. Here’s a hint: it starts with chicken and ends with shawarma. I know, right?! But let’s wrap up this purse story first, shall we? I saw it hanging in the purse department at Macy’s and I instantly loved it. One look at the price tag, and I knew it could be mine. Originally priced at $85, it had been marked down to $45, and then down to $25. Now, I can’t speak for anyone else, but when I see an $85 designer purse (even if I’ve never heard of Giani Bernini) marked down to $25, I’m thinking “I could do this.” I walked away once and thought it over as I browsed, but then circled back like a shark and grabbed it. I had to. The power of Macy’s compelled me. C’mon… just look at how much space is in this bag! So jump ahead now to me at the cash register, reclaiming my cute walking shoes and handing over my new olive green purse for payment. Cue the angel music, because when she rang up the purse, it came up as $20. 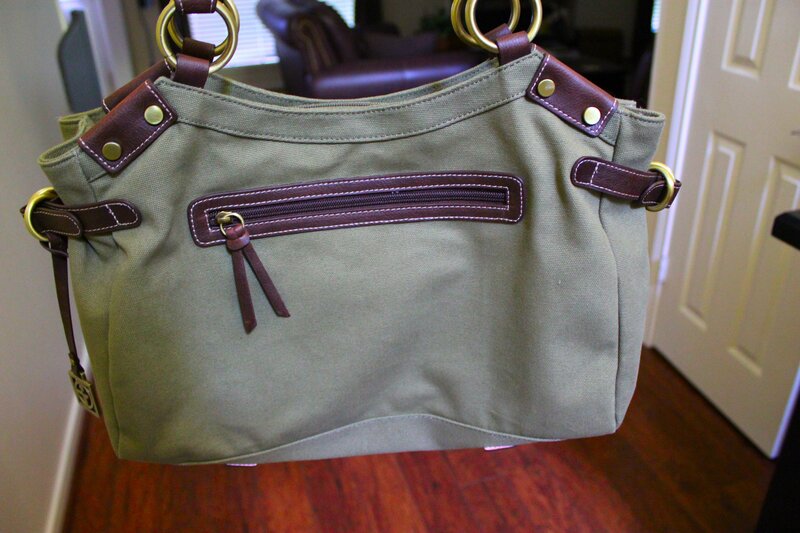 That’s right… my sale purse was on sale! My $25 dollar formerly $85 dollar purse was on sale for 20% off. Shut the front door! All I can say is “Thank you, God in heaven for Macy’s clearance sales.” Well, that and “And I’ll try to be good from now on” because it never hurts to throw that in. Notice I said try. My momma didn’t raise no fool. Hey, Katie! Good to know there are other Macy’s groupies out there. I have two stores in my area, each about 15 minutes away but in opposite directions. It’s a dangerous thing. But since I love a good sale and the thrill of getting something fabulous on the cheap, I’m pretty good about shopping there AND saving money. Although The Complete Package would say that the best way to save money would be to stay out of the store. Boys are stinky. Congrats on the bargain – that’s always the best feeling in my opinion. There is a clear dividing line in the comfortable shoe market – those that look like nurses wear them and those that look sporty. I lean towards sporty, although I can appreciate why nurses and other shift workers need comfortable, supportive shoes regardless of fashion. If I were on my feet for 12 hours a day, I’d opt for whatever keeps me sane and comfortable, too. If Son #2 was a puppy who grew into his feet (as the saying goes), he’d be 11 feet tall. I can SO feel for him. I may have the opposite problem, but hard-to-find shoes are hard-to-find shoes, and either way it’s a pain. 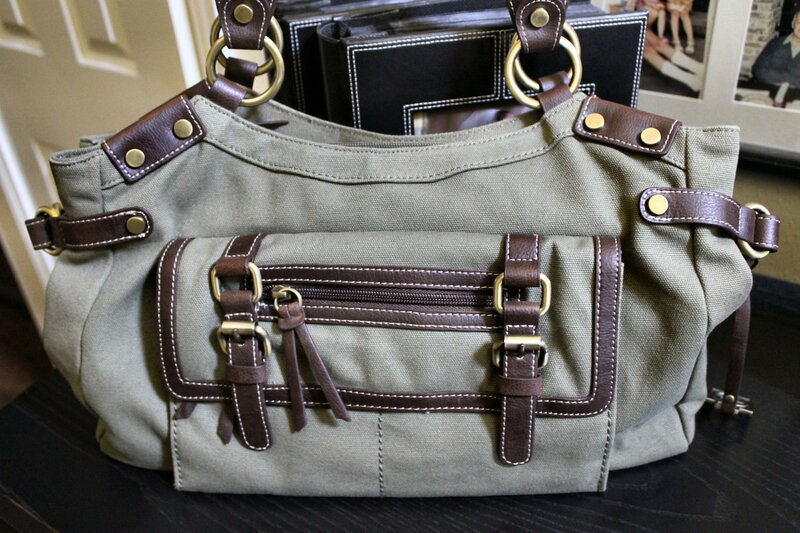 As for obsessions, I have a thing for messenger bags, too. And transferware dishes. And glass cake stands. And old wooden spoons. And vintage fabrics. I could go on and on. One of these days, we’re going to have to meet up for an antiquing/thrift shop weekend – complete with chai and pastries. Sounds like it is time to send you to Paint Shop Pro advanced training so you learn how to adjust contrast, color, etc. for just portions of pictures. Happy to lead the class for a bowl of posole. ;-) …. or better yet it may be time to get a light box …. or better yet get a light box and some Paint Shop Pro advanced training (that will cost two bowls of posole) ;-) ;-) yummmmm. I vote for buying the light box, but not until I try the cardboard covered in aluminum foil trick for reflecting light. It’s not that I don’t want to spend the money. It’s just that I’d get a kick out of rigging it myself. I’ll call it MacGyver-ogrophy. I will take you up on the lesson on how to select just a portion of the photo to enhance. I think you showed me once before, but that was months ago, and I’ve slept since then. A lot. Thanks, honey. PS – I can’t make you no damn posole until you smoke some pork ribs. So there. This stream of consciousness Dr. Pepper fueled post had me cracking up! Love the purse! Very militiary-chic. Which I hear is “in” right now, but my hearing ain’t what it used to be. There is nothing better than finding something you love that is on super-dog-clearance-sale. Aw, stop it! You’re gonna give me a big(er) head! I get quiet when I drink. I love the purse, but I want to see the SHOES!!!! Do you have a linky? Hey, Mads! I knew you’d be interested in the shoes. (One word – Zappos.) I sort of have a link, but I must have bought a discontinued color. Mine are a pale raisin/plum color with gray accents. Can’t seem to find my exact pair online, but this link shows the style. They’re super comfortable – like wearing bunny slippers, but with a good bounce in the heel. 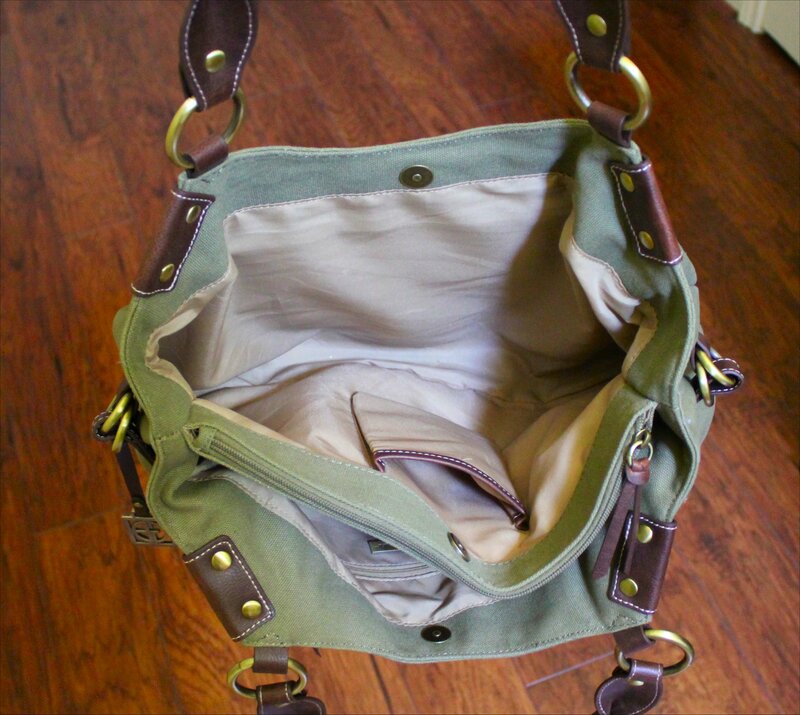 I’m now on a mission to find a professional looking purse that has a lot of compartments for all of my junk. Macy’s will be my next big adventure. Although, maybe I should tell myself that I’m looking for shoes so that I can stumble upon a great purse deal. Trickery. I agree, Debbie. Nothing beats a stellar bargain, no matter where you find it!